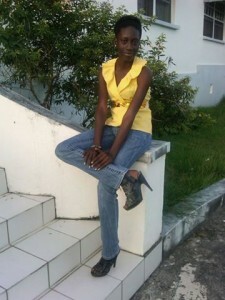 World Poetry Proudly Presents La Shawna Griffith from Barbados! Ariadne’s Notes! We are honoured to present the talented La Shawna Griffith! One of the wonderful youth of the world. Congratulations on her upcoming graduation! Breaking News! La Shawna Griffith is a twenty one year old Barbadian student who shall soon be graduating from The University Of The West Indies with a Bachelor’s of Science in Political Science (Special). With her degree aside, La Shawna is a very articulate and passionate person and her free time is spent writing beautiful pieces where she paints a vivid picture causing many to ponder, laugh, smile and cry about the stuff she has written. In the beginning her work focused mainly on political issues but now she is spreading her wings to tackle all areas writing on race, love, heartbreak, depression, human rights , domestic violence and empowerment. La Shawna first starting writing at the age of nine when she was in Primary School however it was during her tenure at the University that she decided to take her hobby a bit further to see results she would get. Thus lead to the creation of her Facebook Page under the alias “The Political Poet” https://www.facebook.com/Iamthepoliticalpoet?ref=aymt_homepage_panel as well as the launch of her website which she named “Inside Her Head http://lashawnagriffith.wix.com/insidemyhead . La Shawna is slowly becoming an emerging poet and she is hoping to make a change in her work as well as in the world by becoming a role model to young women and hopefully a Minister Of Education someday. I have to be a poet. Why isn’t the man questioned? How dare you make such a claim? Was that verse lost in your pursuit of hatred? This entry was posted in Ariadne's Notes, Featured Poets, General and tagged International Peace Award Ariadne Sawyer, La Shawna Griffith on May 24, 2015 by Ariadne. I would like to thank you so much for this feature. It means so much to me . I am honored and extremely humbled by this gesture. Thank you so much for making an island girls dreams of touching persons lives with her poetry come true. So proud of you! Would be great to have you again. Wow! That is one powerful, fiery poem, full of passion and indignation and conviction.